ENTEBBE – KCCA FC have on Friday morning departed for Congo Brazzaville as the Uganda Cup champions build up to their CAF Confederations Cup play-off round clash away to Otoho d’Oyo. A team of 31 personnel departed Entebbe Airport aboard Boeing 737-800 – Rwanda Air and will have a stopover at Kigali International Airport before finally connecting to Brazzaville. The contingent comprised of 18 players, eight technical team members and five officials. 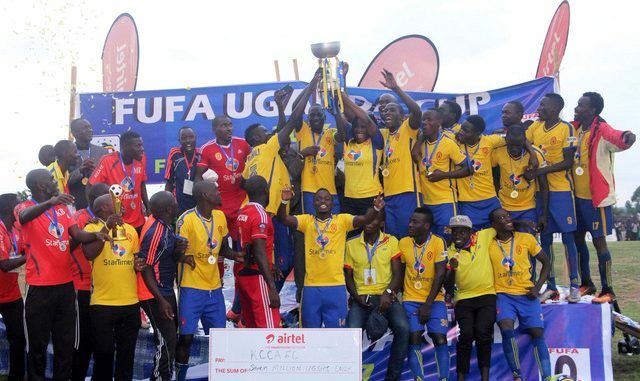 However, the players did not include Jackson Nunda who was left out following a Hip injury sustained in KCCA FC’s 1-0 win over URA in the StarTimes Uganda Premier League on Tuesday afternoon. Nunda has been a key component for the Kasasiros, top scoring in the 2018 CAF Champions League for Mike Mutebi’s side. However, with an array of talent available in the midfield department, Mike Mutebi has more than capable replacements for the talented-lanky play-maker. KCCA FC need to overcome Otoho after two legs in order to reach the Group stages where they last featured in 2017. The other Uganda CAF Confederations Cup representative, Vipers SC host Tunisian giants-CS Sfaxien on Saturday in the first leg of their play-off. Juma Marjan Abdul Hamid (Leader of Delegation), Tom Lwanga (Board member Technical Director), Kirunga Micheal Bitonde (Finance Manager /Advance person), Magero Moses Mwanje (Public Relations Officer), Babirye Aminah (Media Officer). Mutebi Mike Hillary (Team Manager), Byekwaso Morley (Assistant Manager), Kaddu Badru (Fitness Coach), Kiwanuka Daniel (Goal Keeper Coach), Malinga Richard (Assistant Coach 1), Kabuye Robert (Assistant Coach 2), Ssewanyana Ivan (Physiotherpist / Team Doctor), Tusuubira Emmanuel (Assistant Physiotherapist).